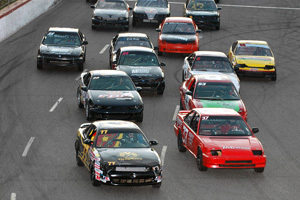 The Mini-Stocks are creating a buzz around Elko Speedway! They made their debut during the 2003 season. Described as a true entry-level division, these four cylinder cars are a throw back to the days of true stock car racing. Mini-Stocks have swarmed the nation, providing four to five wide racing along with many thrills and spills along the way. These popular Eve of Destruction races will be included in the All-American Series Events during the 2008 Season! Don’t miss what all the buzz is about.